As part of the IMF's latest global economic forecast, which for the first time since 2016 saw the D.C.-based organization cut its global growth forecasts, the IMF warned that a severe recession would slash US public wealth by about $5 trillion, causing vastly more damage to Washington's finances than just an increase in debt and deficits. 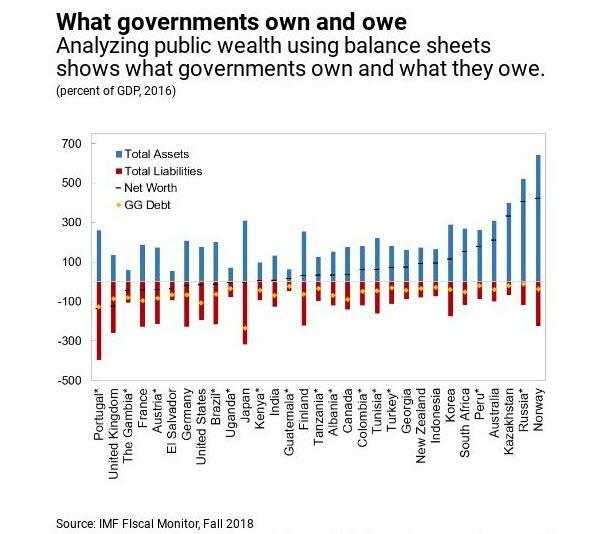 At the same time, governments around the world, many of which face similar dangers, do not clearly publicize their overall net worths, the International Monetary Fund said in its new report, noting that "Few governments know how much they own" or how they use those assets for the public’s well-being, the IMF explained. This creates a potential blind spot for policymakers who could use this knowledge to head off economic risks; Knowing what a government owns and how they can put their assets to better use matters because they can earn about 3% of GDP more in revenues each year and reduce risks, all at once according to France24. That’s as much revenue as governments make from corporate income tax receipts in advanced economies. Governments can put this money toward better schools, hospitals, or other priority spending. Public assets consist of public infrastructure such as roads, bridges, and sewer pipes, as well as the money governments have in the bank, their financial investments, and payments owed to them by individuals and businesses. According to the IMF, "natural resource reserves in the ground are also part of assets, something that is particularly important for natural resource-rich countries. But assets also include state-owned enterprises such as public banks and, in many countries, utilities such as public electricity and water companies." Meanwhile, total liabilities are much larger than debt alone. They come to about 198% of GDP, less than half of which is general government public debt. Pension obligations to civil servants are a large part of the remainder, yet few countries record them as such. The global crisis lender, which in Indonesia this week is staging its annual meetings with the World Bank, cut its outlook for global GDP on Monday by two tenths to 3.7% through next year. The fund pointed to rising trade tensions as a cause for worry and also predicted slower growth in the United States next year and beyond. Beyond tax revenues and sovereign debts, a government's balance sheet contains a range of other assets and liabilities, such as the state enterprises, land and natural resources it owns as well as the money it has to pay to fund public-sector employee pensions. 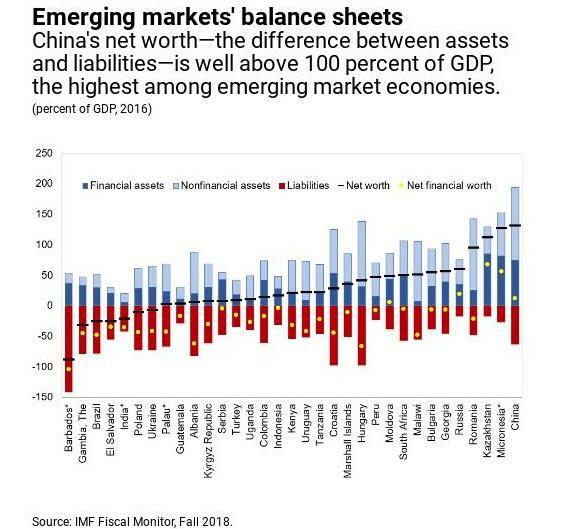 The difference between the two sides of the ledger is a country's net worth. Countries that take such a broad approach to their finances may face lower borrowing costs and see higher revenues, making them more resilient in a downturn, the IMF said. But after a decade of recovery, the net worths of most Group of Seven economies are now negative, it said. Meanwhile, the net worth of the United States has been in decline for nearly four decades. Worsening notably due to the global financial crisis, it had sunk by 2016 to negative 17% as a share of GDP, the report said. The federal mortgage giants Fannie Mae and Freddie Mac, which the government took over during the crisis, have lent a staggering amount - 44% of GDP - to the private sector. But the biggest source of risk comes from state and local government retirement pensions, which can lose money when Wall Street sinks - meaning the shortfall has to come out of local government budgets. Towns and states then have to cut spending elsewhere, creating a drag on the economy. Using a hypothetical "stress test" scenario developed by the Fed for banking regulation, the IMF found a severe recession would cut the value of America's publicly held assets by an amount equal to 26 percent of GDP by 2020. And, at current levels, that would amount to about $5 trillion. Naturally, in a several recession, defaults on mortgages and student loans as well as pension fund shortfalls would all jump sharply, the report found.